Although concert dance documentation serves the art of dance, there are a number of aesthetic choices that must be considered when conducting a documentation project. Below is a list of issues, followed by techniques/recommendations. The purpose of a documentation shot is to capture the maximum amount of information about the choreography. 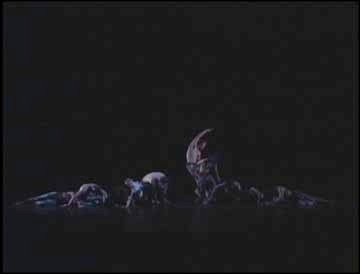 It is important to acknowledge that the choreographer has made compositional choices while creating the dance and that composition within the camera’s frame may alter perception. Keep in mind that the eye of the camera is the sole perspective of the viewing audience once the work has been documented. A wide shot should include all areas of the stage utilized in performance. The inclusion of the entire performance space documents the negative spaces that are compositionally essential. I think Doris would agree! (The Art of Making Dances, The Stage Space) Different types of dances require different vantage points and choreographers may create with an intended viewing angle. For instance, choreographic emphasis may be placed on spatial pathways requiring a higher angle to see the stage floor. These issues should be taken into consideration when determining camera placement. Regardless of the dance, the framing of the proscenium should be consistent from shoot to shoot and should simulate the experience of viewing from the theater. Choosing a lens, wide-angle or telephoto, may also influence perspective. A number of techniques may be used to properly position the stage in the frame and create a pleasing composition for viewing. Determining position in the frame involves attention to X, Y, and Z coordinates. Horizontal panning and leveling are responsible for centering and balancing the stage. Many tripods include a leveling bubble that can be very helpful, especially for maintaining the horizontal while panning during follow shots. Stationary cameras may also benefit from the level feature, but should confirm horizontal level and balance by viewing the stage in a monitor. Vertical tilt is used to ground the stage in the frame, giving it a sense of gravity and stability. By placing the downstage edge of the performance space well below the center point, one may avoid the feeling that the dance is floating in space. It is helpful to mark this vertical placement on the monitor, or use architectural landmarks for consistency. This will prevent vertical movement of the stage if footage shot at different times is edited together later in post-production. Adjustments in vertical position may also be adjusted using Motion Settings within most professional video editing programs. Setting the zoom of the camera to include the entire stage addresses the Z coordinate and finalizes frame composition. Zooming wide enough to include the most downstage wings helps to capture all entrances and exits. A wide-angle lens should only be used when distance from the stage is limited and the complete stage cannot be framed otherwise. Composition within the frame of moving cameras is addressed in the next issue, Spatial Intent. Kristi Egtvedt's staging is implied by her placement in the frame in Paul Taylor's Dream Girls. The communicative potential of the placement of dancers on the stage is immense. These staging choices by the choreographer must be maintained while documenting dance, not only when framing the entire stage, but also with a tighter follow shot. When a camera is panning, tilting, and zooming in the process of documenting dance, it is adding motion to motion. This process has the potential to accentuate spatial intent, or erase it completely. If the camera shooting a person walking by continues to pan with them, keeping them centered in the frame, they will appear to go nowhere. If they are framed with greater negative space in front of them, they will at least appear to be moving toward their destination. But, if they are allowed to enter the frame on one side, travel through the frame, and exit on the opposite side, they will appear to have traveled. An accurate representation of reality will have been generated. With this basic concept in mind, the dance videographer must allow for movement within the frame to suggest locomotion and pathway. Because of these issues specific to dance, the Rule of Thirds, often used in film becomes obsolete. It is when operating the moving camera in conjunction with dancers on the stage that the skilled videographer may exhibit expertise and positively contribute to the documentation process. Developing conceptual understanding of the choreographic process and fine-tuning kinetic sensitivity with the camera are both essential. Dance videographers must master the techniques of weight shift and breath in order to execute smooth motion with the camera that will not distract from the dance experience. Embracing the camera and moving in a manner, much like that of partnering in dance, can result in a perceivable sensitivity to motion. Resistance and a fluid head on the tripod are essential. Attention to the subtle execution of acceleration and deceleration can also contribute to masterful camerawork when shooting a constantly changing dynamic frame. Dancer Michael Trusnovec passes through center of the frame as he passes center stage in Paul Taylor's Dream Girls. Spatially, the camera’s 2-dimensional frame may be thought of as the parallel to the 3-dimensional stage. Therefore, placement within the stage may be simulated and/or redefined within the frame for documentation purposes. Regardless of camera angle, the full-body shot of a dancer may be allowed to move within the frame to suggest the choreographer’s spatial intent. 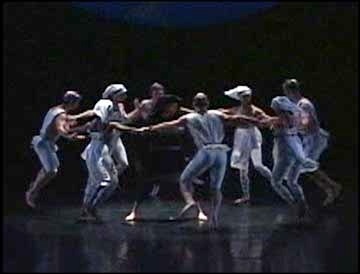 If a dancer performs along a diagonal on the stage, the dancers should be allowed to progress from corner to corner in the frame, passing center of the frame at the moment the dancer passes center stage. This method of working requires familiarity with the movement in order to anticipate abrupt locomotion and level changes. Axial movement, movement not traveling out into space, may also be framed in a manner that defines negative space surrounding the figure. Dancer Amy Knauff's spatial design is maintained within the frame during this follow shot of her work Her. Diagonal progressions in space are implied with movement in the frame as Melissa Keil performs this ballet variation. A number of issues may effect the placement of cameras and the angles from which dance is to be documented. Frontal distance from the stage and width of side cameras may be limited due to the facility’s architectural structure. Other choices, however, may influence documentation, both aesthetically and functionally. Each dance may require unique angles, dependent on the detail of movement to be recorded. Large, spacious dances may benefit most from an aerial view, while dances including intricate footwork may suggest a much lower angle. Height of the camera in relation to the stage can also have drastic implications for the body proportions and body image of dancers. High angles tend to shorten the legs and lengthen the torso, while extreme low angles lengthen the legs and decrease the length of the torso. Also, the degrees of distance between cameras in a multi-camera shoot should be considered to prevent jarring edits from angle to angle in post-production. A medium shot of Paul Taylor's In the Beginning captures more detail than a wide shot while keeping all the dancers in the frame. Analyze the content of a dance and speak to the choreographer, if possible, to determine the important components of the dance before determining camera angle(s). If the dance does not require any specialized angles, attempt to place the camera at a height that will not drastically distort body proportions, but will allow for viewing the stage floor. This seems to add dimension and perspective to the stage. Center the wide documentation shot and place any additional cameras at great enough distances from center as not to result in jarring edits. Film production manuals offer a number of recommendations for degrees of separation. Placing two cameras in a parallel position, one wide and one tight, can also be effective when cutting from camera to camera. Accessories, such as cranes and dollies, can offer additional flexibility with camera angles. Modern dance pioneer Daniel Nagrin provides valuable information regarding the effects of videography on dance in his article, The Art of Videotaping Dance. In Falling Off the Back Porch by Clay Taliaferro, higher angles work well for documenting pathways on the stage. A wide angle is needed to capture the many entrances and exits in Taylor's Klezmerbluegrass. Dedicating time, early in the process, to testing and evaluating issues related to documentation efforts can lead to a more aesthetically cohesive collection of archival products. While remaining flexible to the specific needs of each choreographic work, one may develop an identity through stylistic choices and consistency in method of documentation. Goals for documentation directly influence all choices made throughout process. If clear guidelines are established, decisions may be made while keeping larger objectives in mind. Take into consideration logistical, aesthetic, technical, and functional issues when beginning a series of recordings within a documentation facility. Evaluate the facility to determine the best geometry of documentation. Set appropriate lighting cues that can be recreated. Determine audio levels and set camera placement and level. Most of all, determine a method for documenting the set-up for documentation! The continued application of best practices will improve, not only the quality of work generated, but allow for more seamless compositing of footage collected over a number of years. Reevaluate everything on a regular basis and make modifications for improvement. When thinking of video documentation of dance one must remember that video contains audio, and audio elements are often extremely important in recording the performance experience. Dances performed to music are largely dependent on the music and dance relationship. Aside from the accompanying score, other audio elements such as audience response and stage sounds may be documented, adding a sense of realism to the somewhat flattened video experience. Adding depth to documentation by including such details brings life to the documentation, now housed within a 2-dimensional frame that attempts to display effort and qualitative nuance through implied dynamics that are created by combinations of time and space. Accentuating the aesthetic of dance documentation may be accomplished by ensuring high quality recording and by placing value on the inclusion of additional audio elements associated with performance. A CD-quality audio feed from the sound board should be sent to at least one documentation camera. Stage mics should be positioned as to record breathing, moments of bodily contact, weight shifts, and other sounds associated with dance. Live musicians or vocalists should be properly recorded during actual performances, as tempi tend to shift from performance to performance. Recording should include audience response, even through the last clap of applause. Nothing is more upsetting than the disruption of cutting to a blue screen or static during those precious reflective moments at the end of a performance viewing. Once all audio for a performance has been mastered and audio levels have been set, a sound check should be conducted, specifically for setting a level on the cameras. Headphones should be used to monitor audio levels throughout a shoot. Performance lighting makes it almost impossible to document movement details here in Paul Taylor's Dante Variations. One cannot underestimate the importance of lighting in dance documentation. Whether attempting to capture performance lighting as a component of documentation, or designing lights specifically for video, many issues surface. Although video technology is constantly improving, no camera has yet to accurately approximate the abilities of the human eye. Because the value range on a video camera is somewhat limited, the camera is unable to record the vast spectrum of illuminations often found on the dance stage. When documenting dance including lighting design, the extreme ranges must be altered to fit within the capabilities of the camera. The ambiance of live performance is completely lost the minute lights are neutralized for a video shoot. With this goes the aesthetic. Deciding how to handle the issue of lighting requires clarification on the intent of the session. How important is it to include the lighting element, or should the purpose of documentation be strictly for documenting the choreographic element? First, determine the purpose of documentation and decide if lighting design will be essential in the documentation product. If not, then compose a lighting cue slightly brighter than medium intensity and find the shutter speed and iris setting that works best with the costume values and skin tones. If performance lighting is to be included, determine if adjustments are to be made from the lighting board, or within the camera. If from the board, identify the brightest and darkest cues, modify them to be less extreme, and alter other cues in relation to this new range. View each cue with dancers on stage in costume and determine the best exposure combination for the situation. If adjusting the cues is not possible and the decision is made to alter illumination within the camera, then here’s where the fun begins! No matter how expensive the camera, auto exposure never seems suitable for concert dance documentation. So, with one hand on the zoom ring, and the other on the record button, the skilled videographer now uses his third hand to manually adjust the iris. Gradual adjustments must be made to compensate for intensity changes as lights transition from cue to cue. Abrupt changes in illumination must be anticipated. Such engagement results in a mind/body experience comparable to dancing itself! Prior to beginning a session, two lighting cues are needed to prepare the camera(s) for the shoot. A medium intensity, white balance cue containing no color is necessary for defining the way the camera sees true white on stage. See White Balance under the Technical Issues for more information. A second cue is needed to facilitate the accurate framing of the stage. This framing cue should illuminate the entire theater so the videographer can see architectural elements to confirm symmetry within the frame, tilt, and level. For more information on related issues, see the Costumes under Functional Issues and Exposure and Gain under Technical Issues.